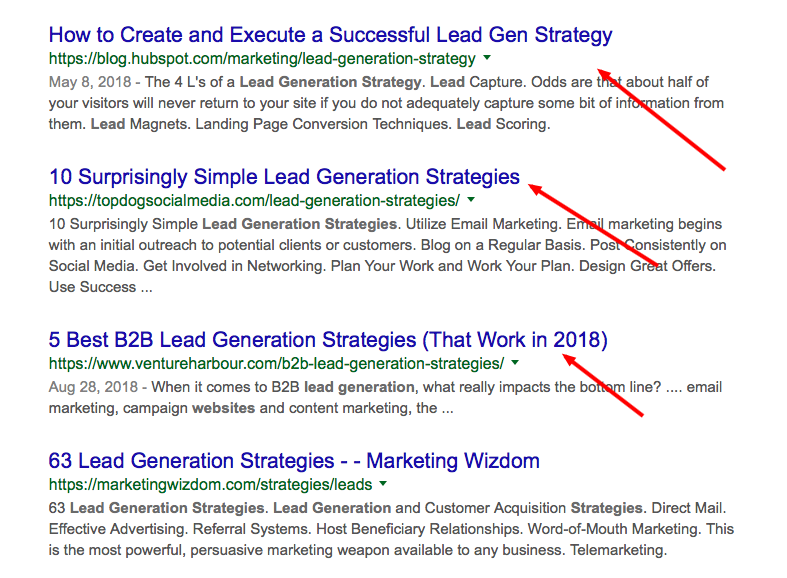 Content marketers and business owners often fail to realize that leads and conversions are not an immediate result of content marketing efforts. I have come across clients who start measuring the rate of conversion from the first blog post they publish! Content is not a sales pitch, period. It’s a strategy to publish what your audience cares about. It’s not even a magic ranking formula that helps you add keywords, stats and images in your content. 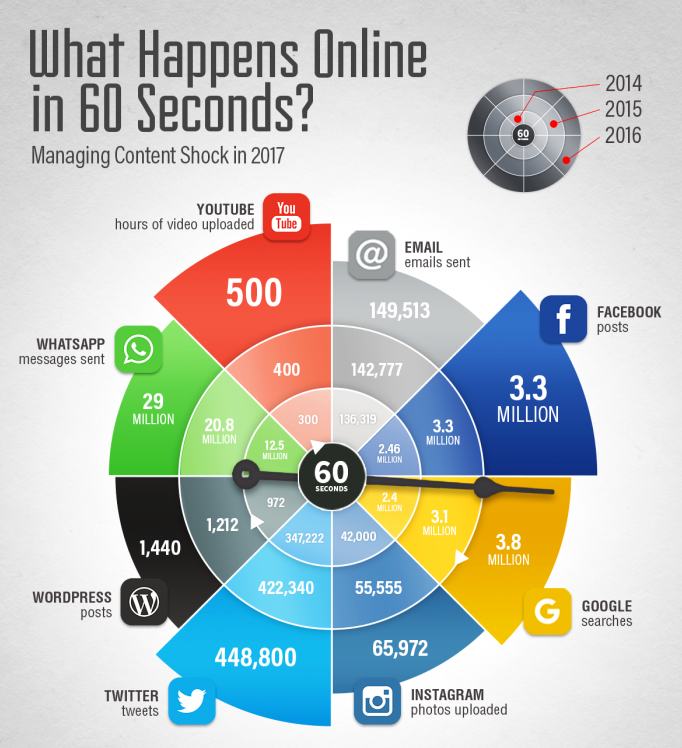 It’s a long-drawn-out and continuous battle of building an audience that prefers your content over everything else. When you’re a leader, you have loyal fans and followers who look up to your content. Create content to educate and entertain a niche audience. Solve some of their key problems and build a relationship with them. Identifying intent is the first step in that direction. The searcher intent here is to look for the best CRM software for her small business. 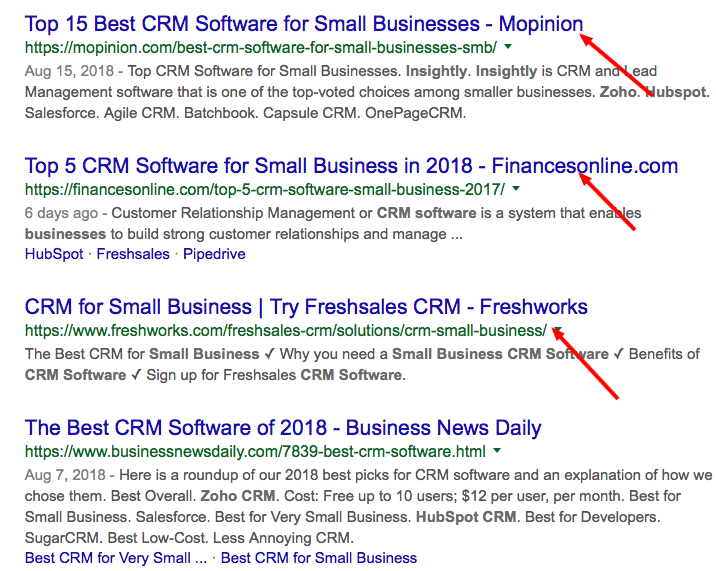 Many content marketers make the mistake of targeting this keyword phrase with the wrong content piece. 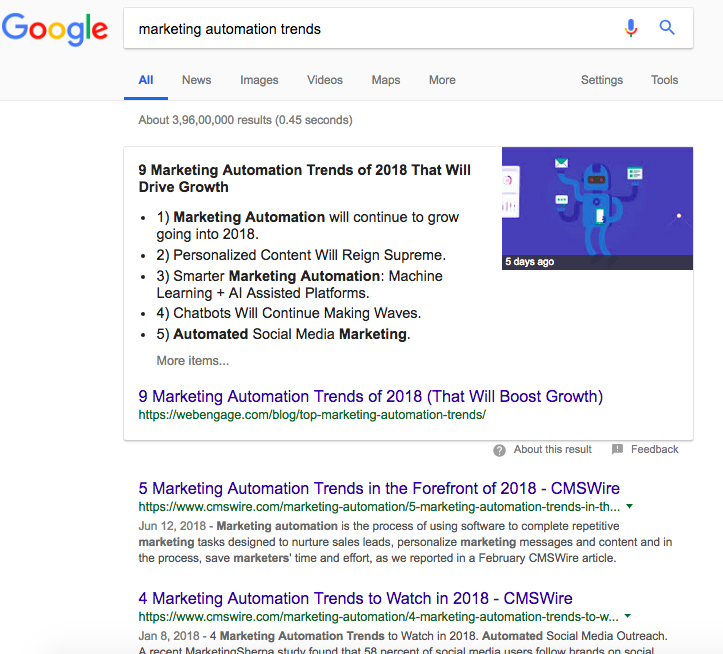 You’ll find them creating a blog post like CRM trends 2018 while targeting the above keyword. That’s a big blunder! It’s obvious that searchers looking for trends are not looking for a tool and those looking for a tool are not looking for trends. If your content piece is the best in the niche, it will have a high probability of ranking up higher on search results. Google algorithms have evolved over time. The search engine makes use of advanced machine learning to predict the meaning of search queries and provide more accurate results. Google aims to provide its users with relevant answers and the best user experience. Let’s now look at the most common intentions behind user queries and understand how you can deliver smarter and user-friendly content. Informational: When the user is looking to learn about something or solve a problem. Commercial: The user has a purchase intent which may not be immediate. Transactional: The user intends to make an immediate purchase. Before understanding each of these in detail, let’s first understand customer lifecycle and its various stages. Each individual in your audience goes through various stages before they turn into loyal customers of your business. This is called customer lifecycle. Awareness Stage: This is the stage when your target customer does not know about the problem s/he is facing or about your offering (the solution to the problem). Solution Awareness Stage: Your target knows about the problem s/he is facing and the possible solution to it. Solution Comparison Stage: The potential customer knows about the various options available in the market. S/he is not ready for immediate purchase and is researching the available options. Decision Stage: When the user has made a choice about the product or service that would best meet her requirements. Retention Stage: A user who was once a stranger is now an existing customer. Let’s now understand how you should create content that satisfies user intent within the framework of the customer lifecycle. Since at this stage the user has yet to learn about CRM as a solution for her business, she is not looking for stuff that’s directly related to CRM. This is a phase when you’ll find users typing niche keywords. 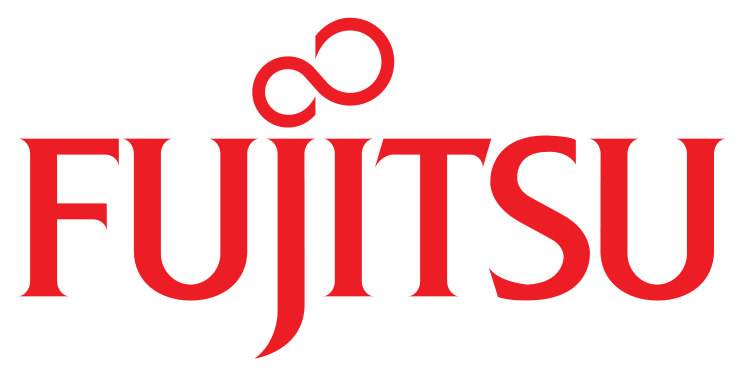 They know the solution to their current business challenge is CRM and they would be looking to gain more knowledge about the subject. The user intent over here is commercial. The user is looking to understand the key features of different CRM tools to be able to make a wise choice. 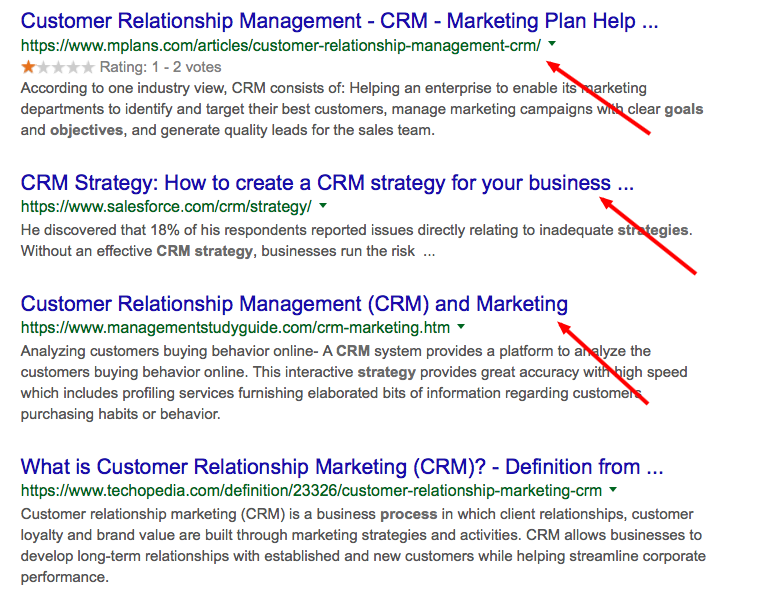 You can target such keywords with listicles as well as comparative posts. 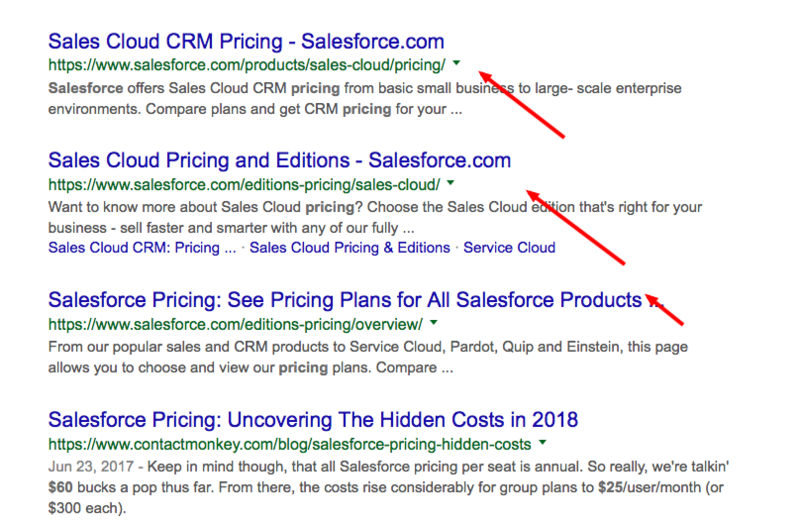 The screenshot above shows that Salesforce has targeted the comparative query with a blog post and achieved the second spot in organic SERPs. 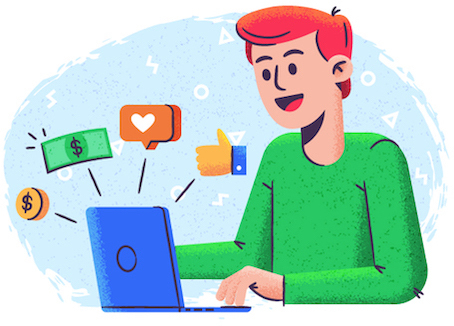 To satisfy the user intent for these keywords, you must have a bunch of well-structured website landing pages catering to the respective queries. It’s essential to provide your users with detailed product information and features through these pages. 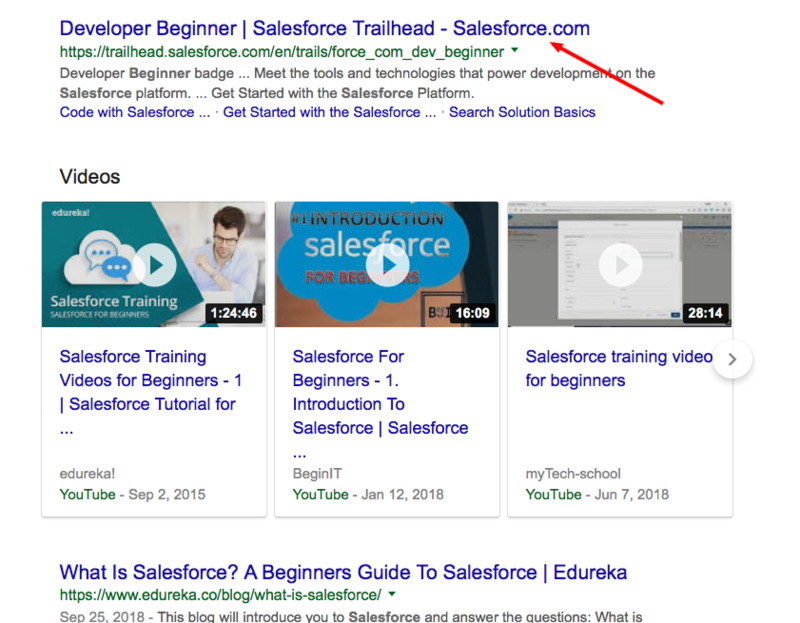 As you can see in the screenshot above, Salesforce has targeted the keyword and created a knowledge-base that’s ranking on top of Google search results. You must create a content plan that aligns with your audience’s search intent. 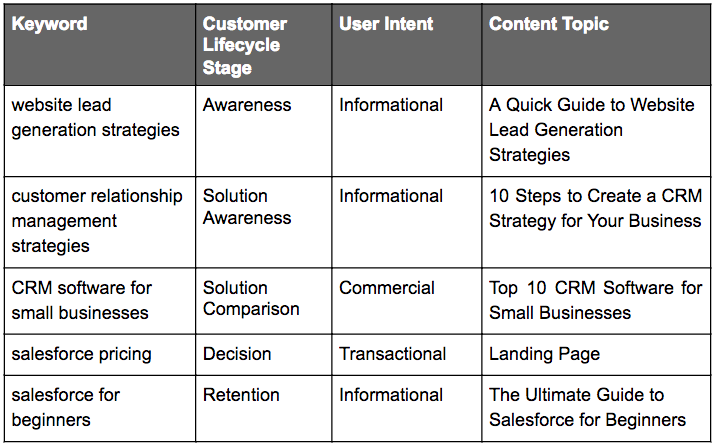 This way you can create a monthly or a quarterly content marketing plan based on user intent and customer lifecycle. I spoke to a few experts on what they feel about user intent and how they are applying it to their content marketing strategy. I received some insightful inputs and cases. Earlier this year we published an article titled Mobile App Usage Statistics in 2018. This article now ranks on page one for the query ‘mobile app statistics 2018’, which is a highly trafficked search term. Essentially we knew that businesses and individuals interested in developing a mobile app, especially those at the top of the funnel, use broad-based search terms like ‘mobile app statistics’. So, in response, we created content that directly addresses that intent. 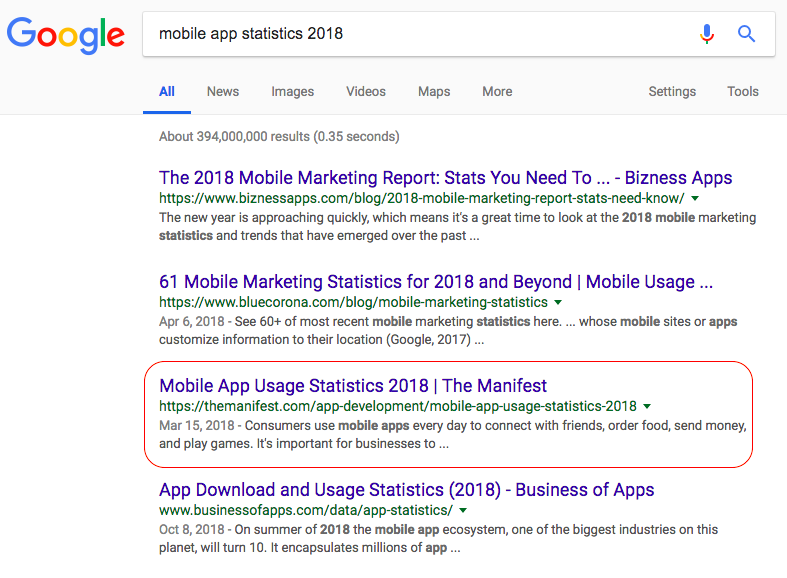 We optimized the content for the key term ‘mobile app statistics’ and formatted it using SEO best practices (bullet points, short sentences, meta descriptions). As a result, we were able to achieve first-page ranking within a few months of the piece being published and the page consistently earns unique pageviews month-over-month. Knowing your customer intent is basic to determining the keywords you are targeting. 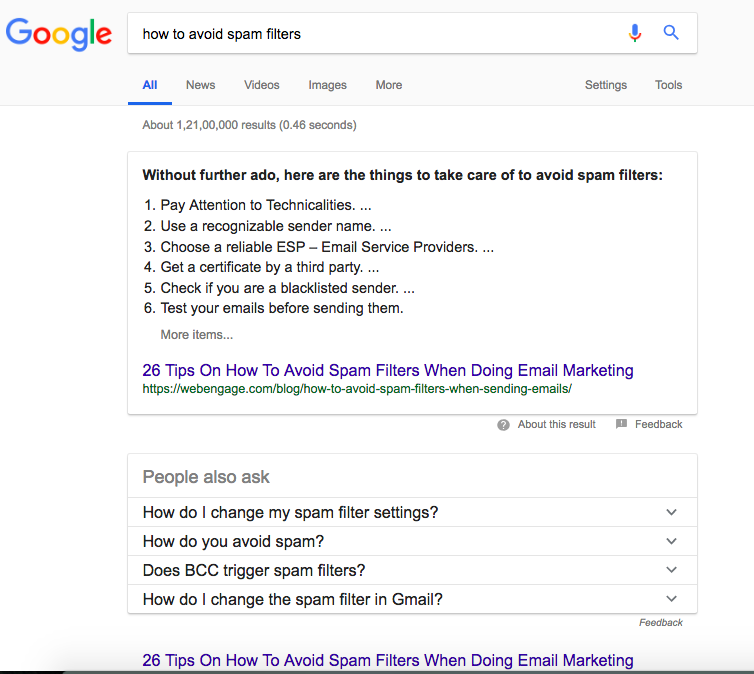 If you optimize for the wrong keywords, you might generate traffic but the rate of abandonment will be high since your visitors would not get the information they are looking for. User intent, therefore, helps you to reduce bounce rate and improve the average time on site. At WebEngage, we use content to solve a fundamental problem for specific audience segments with every piece of content. We try to gauge user intent by looking at popular search terms related to our domain (Marketing Automation). 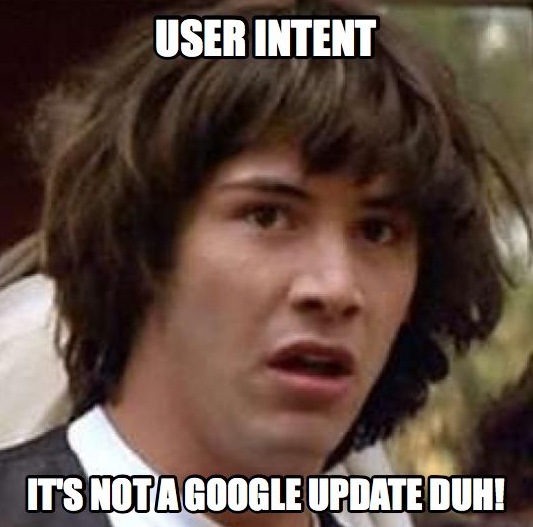 User intent is the foundation of a solid content marketing plan. It goes beyond search volume and competition to understand the user psychology and purpose behind each query. At the end of the day, you’re creating content for your target audience and not for the search engines. It’s an essential step to optimize the overall user experience of your site and your content in order to get better search rankings.